I watched Bigger Stronger Faster last night. 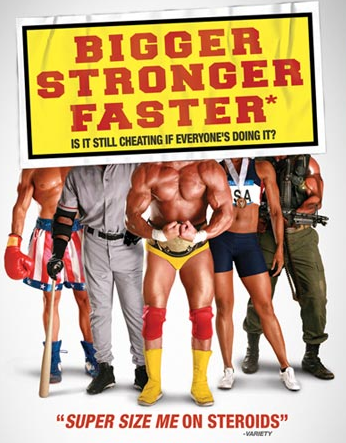 It's a movie about steroid use in sports which is something I thought I was pretty dead set in my opinions about. As a cyclist I'm keenly aware of how widespread cheating in the sport is and I've always held a pretty low opinion of those that did it. A scant few things have challenged my opinions. Outside Magazine famously did a story on an older amateur rider taking all the banned substances he could handle and I remember the takeaway for me was "damn, that HGH actually sounds pretty good." and "Wow, I can see why people take these things." On MetaFilter, user Chuckles compiled a list of 8 previous Tour de France top five results, with everyone implicated in doping marked with an X. If he updated it for 2007 and 2008, there'd be even more X's on the chart. It's really more ubiquitous than we want to think. I have friends that have defended Barry Bonds and other atheletes and frequently mention Tiger Woods had eye surgery to improve his vision, which is another form of performance-enhancement that seems hypocritical to allow (and I can't help but agree with). I sort of expected Bigger Stronger Faster to be either some sort of gross-out "let's take steroids and hurt oursevles" or a depressing "here is how it ruins lives" but it's nothing at all like either of those things. It really literally rocked my world because it presents a side of steroids in sports I'd never considered and it completely changed my opinion of the whole issue. The best part is the main guy and narrator is quite literally just some guy off the street who was interested in examining a complex issue, and his passion for seeking the truth pulls you along through the entire film. I have no idea how the filmmakers found the guy or how the guy got into filmmaking, but he's the perfect subject to move through the film and I shared a lot in common (like my distaste for dopining in sports). I can't recommend this documentary highly enough. 1. Put RFID tags inside the soles of players’ shoes as well as embedded in the floor. Take the “3 seconds in the key” call away from the refs and let technology automatically measure your time in the paint. There is no disputing the call when you trip the clock, and refs can focus on other more important stuff. 2. Accelerometers in shoes communicating with one inside the ball could probably do a better job calling Traveling than the ref. 3. Accelerometers in shoes of players could give the referees more data to judge charging vs. personal foul calls. You could have actual data for who planted their feet first and deserves a charge call or who wasn’t stationary in time and deserves a foul.